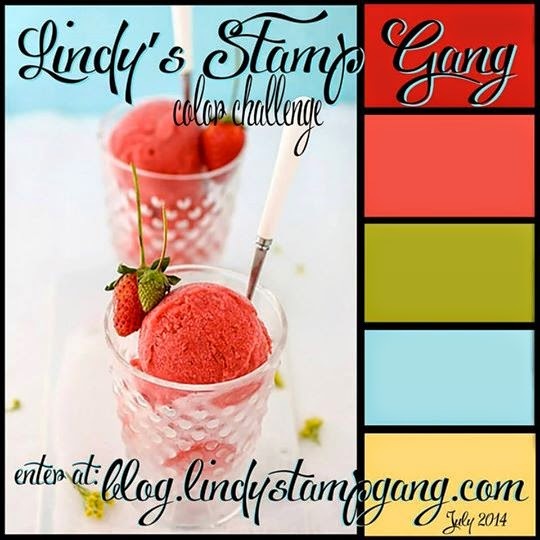 Lindy’s July 2014 color Palette with Lisa! I hope my friends in the US had a wonderful Independence Day. This months Lindys color palette had me inspired to get a little red and blue in this layout, and I just added a bit of white, green and warmth..Is warmth even a color?? Well the Golden Sleigh Bells added a bit of warmth, so I guess it is!! The Lindys Limited Edition Color Challenge Mega Set is a must have!! For the background, I mounted a piece of white cardstock onto a 12×12 piece of corrugated cardboard. I sprayed it in raandom spots with Lindys Starburst spray in Azure Sea Asters. Then I placed a mask over the board and sprayed it with Lindys Starburst Spray in My Mojito Green. I just added a few flecks of color here and there with the Peony Scarlet red and Azure Sea Asters . 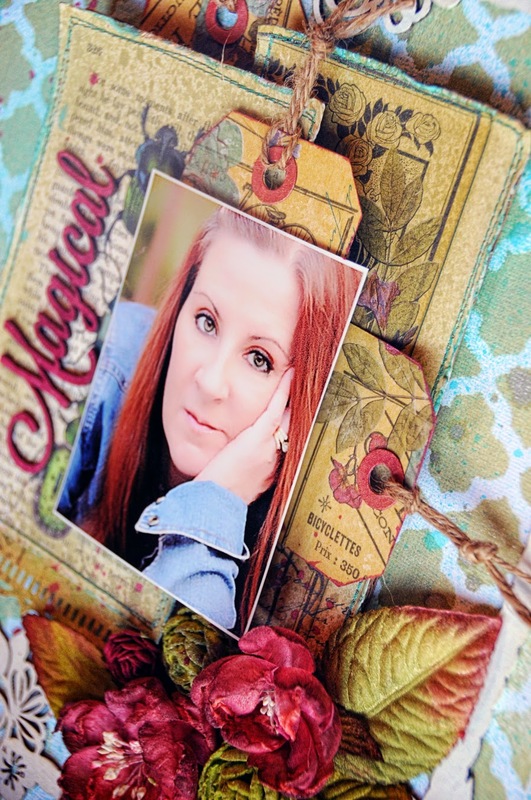 The Blue Fern Studios Chipboard was sprayed with Lindys Starburst spray in Poeny Scarlet Red. The flowers were colored with Lindys Starburst spray in Poeny Scarlet Red as well. The green flowers were enhanced with My Mojito Green. Cathi O’Neill, one of last months Lindys color challenge winners gave me a terrific tip. She uses corrugated cardboard pieces to lift her layers to create depth when you want more of a lift than using pop dots. I use this technique all of the time now. I always have corrugated cardboard in my stash. Thanks my friend for an awesome tip!! For my Blue Fern Studios Chipboard Rose Frame, I painted it with white acrylic paint and then just lightly rubbed some Lindys Starburst spray in Golden Sleighbells.For the pieces of patterned paper I used for my photo matting, I did machine sewing around the pieces, sprayed them with My Mojito green and edged them with Peony Scarlet Red. I sprays the tag holes with the red as well. The just strung a bit of jute through the holes. And dont forget to join our color challenge this month using the gorgeous rich colors of the palette!! Click here for all of the details on how you can join us this month!! This is so elegant – just love it! Love the splatter in the background as well as the pattern!